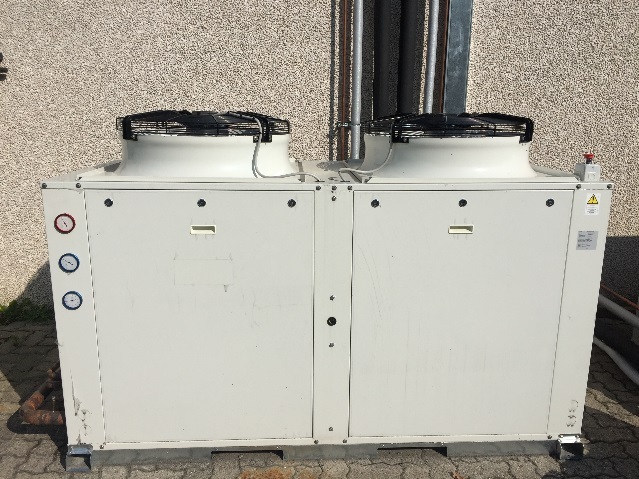 Home / Case Study: Creard R-407H as replacement for R-404A - Cold Storage, Air Food S.r.l. 40m³ Cold rooms for blast chilling (-30°C) of bakery products. Core temperature of the products is reduced from 8°C to -20°C in about 3 hours. Air Food S.r.l. is located close to Malpensa airport. The company provides cabin food for planes and is active as a caterer. Air Food operates its main production site at Cardano Al Campo. The availability of deep frozen ingredients, raw materials and final products is an important part of the production process. A new cold room for deep frozen ingredients and final products was built. 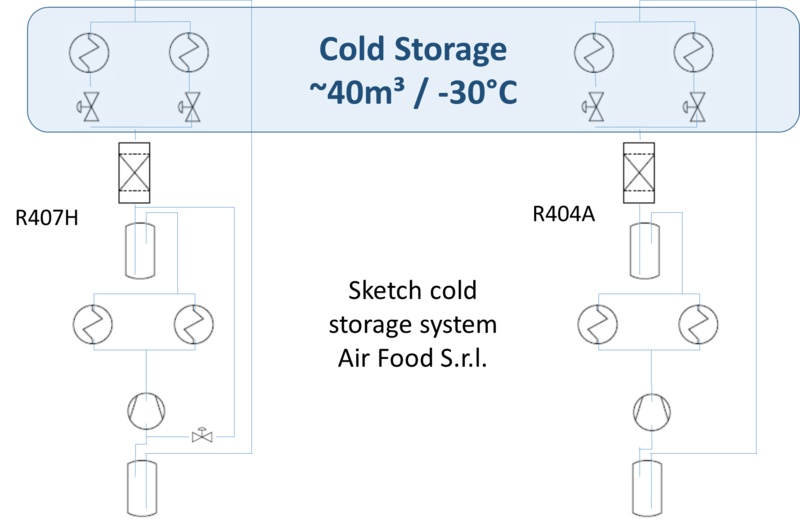 The cold room refrigeration system consists of two independent loops each equipped with parallel evaporators. Both systems are nearly identical and are constructed with the same components. The main difference between the systems is the liquid injection with the R-407H system, which limits the discharge temperatures of the compressor. Compressor power was measured directly as 14.9kW for the R-407H system. Enthalpies were calculated by using the measured pressures (LP + HP) and the measured temperatures entering and leaving the compressor. The COPs were then calculated as the ratio of the enthalpy differences and the measured power consumption. Discharge temperatures increased moderately to 106.8°C during operation without, and to 92.8°C with liquid injection. Both temperatures were within normal operating range. For comparison, the R-404A discharge temperature was 86.5°C. The capacity for cooling the compressor via liquid injection was calculated to be 2kW. Together with the overall capacity, the capacity for storage cooling was calculated to be 28.1kW. The COP for the R-407H system calculated from these values is 1.88. For comparison, the COP for the R-404A system was calculated to be 1.69. The superheat differed between 12.9K (R-407H) and 36.1K (R-404A). The R-407H system was equipped with an R404A thermostatic expansion valve (Danfoss TE12). This R-404A TES12 was not able to regulate the R-407H flow properly. This was due to the higher pressure of the R-404A-filled bulb in the TES12, which kept the TES12 valve open unproportionally. The use of a Danfoss valve type TEX12 designed for R-407C would solve the issue, since its p-T curve is much closer to R-407H than the p-T curve of R-404A. In the parallel operation of both systems, the TE12 in the R-407H cycle operated properly due to the temperature influence of the R-404A cycle. 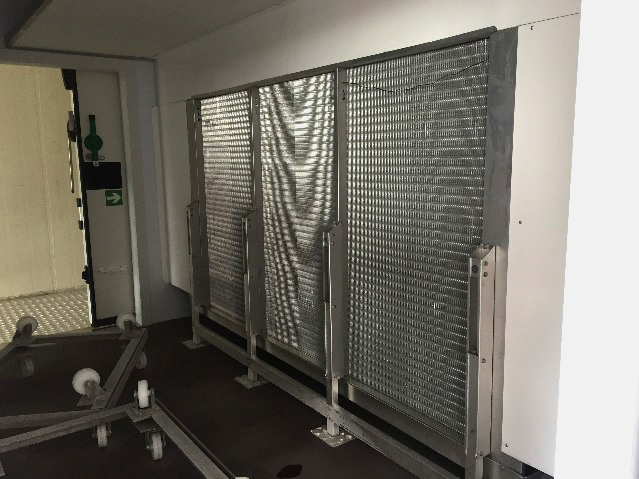 The findings at Air Foods indicate that when operating with this type of cold storage system, Creard R-407H is able to operate under difficult ambient conditions and cycle parameters. A simple liquid injection system was installed to reduce the discharge temperature significantly, but it was found to not be needed under the measured conditions.